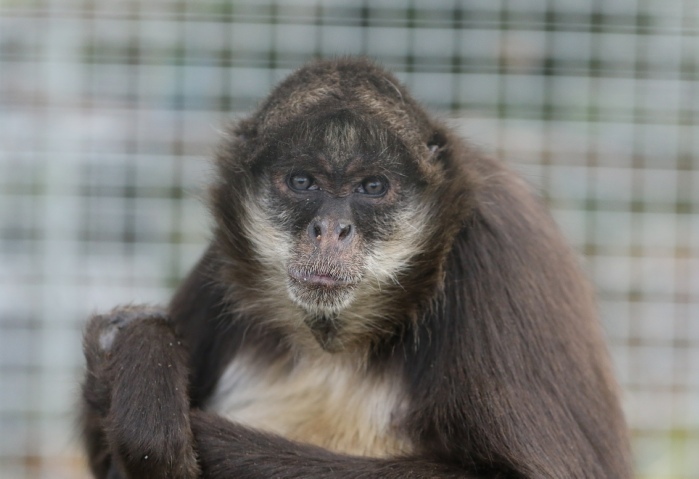 At Wales Ape & Monkey Sanctuary we have two species of Spider Monkey: Black Spider Monkey and Brown Spider Monkey. Spider monkeys... come from South America. They have exceptionally long tails and legs in relation to body length. Their tail is prehensile and extremely flexible and is used as a fifth limb. There is uncertainty as to how many different species of spider monkey can be identified, with suggestions ranging from one to five. 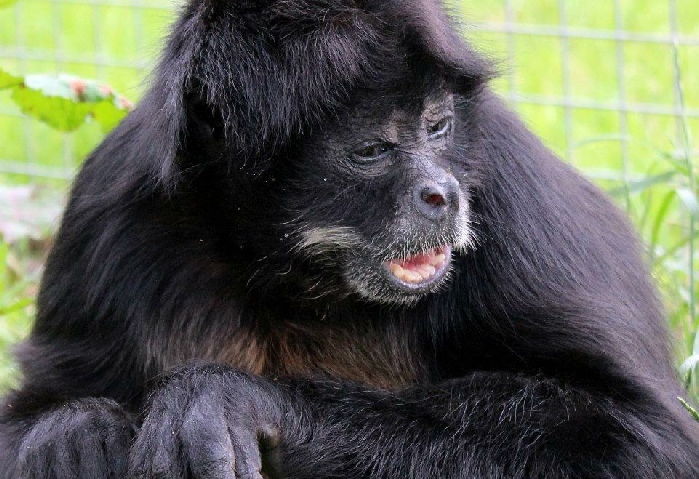 Some Spider Monkeys are all black whilst others are shades of brown and may have black hands and faces. 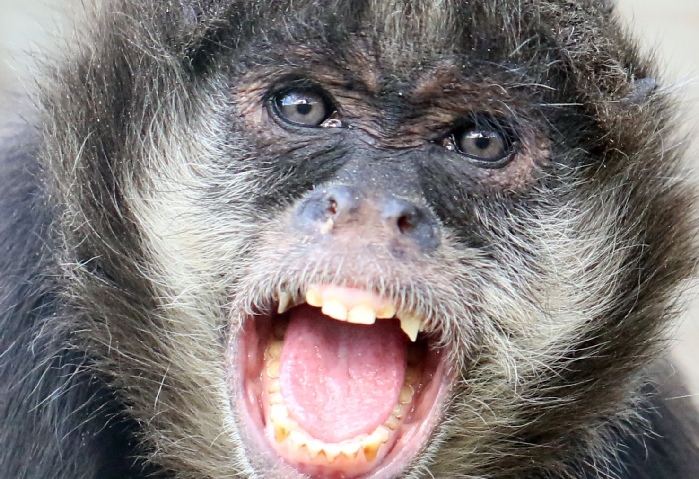 Columbian Black and Black Hand Spider Monkeys are two recognised types, but whether they are different species is open to debate. 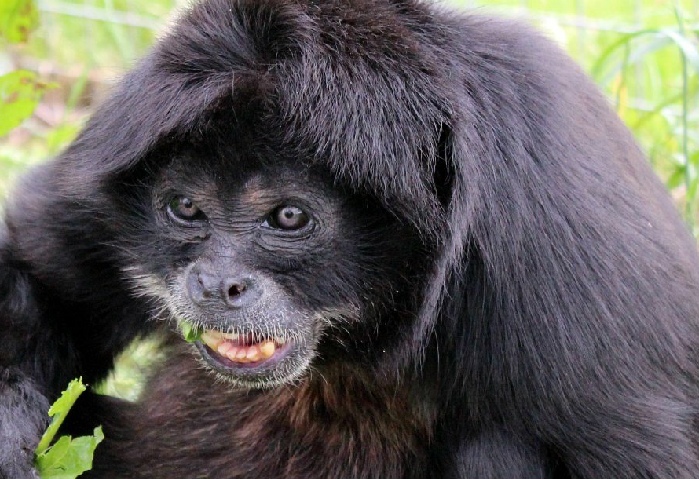 Spider monkeys, like Gibbons, are Brachiators. This means that they get around by swinging beneath the branches of the trees and as such they favour the upper canopy of the forest. Also like Gibbons they can walk upright on two legs along branches, or on the ground. Unlike Gibbons however they have a prehensile tail, which is used not just for balance, but as a fifth limb to aid their rapid locomotion and as an extra anchor for holding on to branches. They appear to prefer wet rain forest, rather than dry forest and they seek out ripe fruits, which make up most of their diet, although they will also eat leaves, birds’ eggs and spiders. Although they may live in groups of average size eighteen to twenty individuals, the whole group does not forage at one time. Only say five or six individuals at a time will split off from the main group to go foraging and these sub groups may be all females, all males, or mixed. Only the males however issue the long warning calls used to alert any separated group members. During the day Spider Monkeys congregate in large groups of thirty or more animals, but split up into smaller groups of six or less for sleeping and hunting. Females only give birth to a single baby every two to five years and as indigenous people hunt them for food their numbers are declining in the wild. Deforestation is also reducing the size and range of their habitat in many areas. Click here to read about Jon Jon, Winston and their friends at the Sanctuary.